German Chancellor Angela Merkel and Japan's top opposition leader clashed Thursday over Tokyo's military mission in support of troops in Afghanistan. Ichiro Ozawa, head of the opposition Democratic Party of Japan, told Merkel he was against the extension of the mission to refuel ships in the Indian Ocean, which expires on Nov. 1, the party said in a statement. 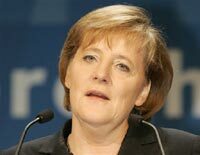 Merkel, however, said she hoped the mission would continue, it said. She said many countries should be involved in anti-terrorism efforts and that Japan should bear a "heavier responsibility" if it wants to play a greater role in diplomacy and international peacekeeping, according to the statement. Ozawa, whose party wrested control of the upper house of parliament from the ruling camp in July 29 elections, has argued that broader United Nations authorization is needed for Japan to engage in the military mission. Merkel arrived in Japan from China on Wednesday and met with Prime Minister Shinzo Abe, who pledged to work with the opposition to ensure an extension of the mission, a pillar of Japan's cooperation with in global anti-terror efforts. "Japan's refueling mission contributes to German navy vessels, and is also sought by the international community. I plan to explain those things to the Democrats," Abe told reporters Thursday. Merkel paid a courtesy call early Thursday to Emperor Akihito, and was to meet with Japanese business leaders and give a speech at a symposium later in the day. Before returning to Germany on Friday, Merkel also is to visit the ancient capital of Kyoto, where the current protocol limiting greenhouse gas emissions was negotiated 10 years ago - underlining her push for a new global agreement to combat climate change when that pact expires in 2012. Merkel, whose country holds the presidency of G-8 this year, has been lobbying for the accord, which nations are to begin negotiating at U.N.-sponsored talks in December. Japan will chair the G-8 next year. At the German-hosted G-8 summit in June, leaders agreed to "seriously consider" proposals to cut emissions of greenhouse gases by 50 percent by 2050 - nonbinding language that was a compromise between the EU, which wants mandatory cuts, and the U.S., which opposes them. Japan has announced an "Abe Initiative" of short- and long-term goals to reduce greenhouse gas emissions, and is also calling for a new global warming pact to succeed the 1997 Kyoto Protocol.